Open Access is an suite of office software made by a German company called Software Products International (SPI). 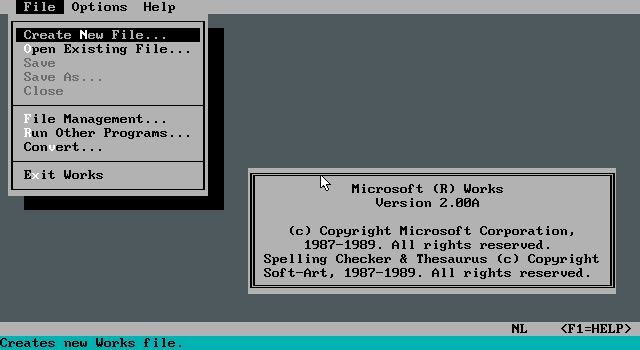 We got this software with our first PC early 1990, but the software copyright is for 1986. 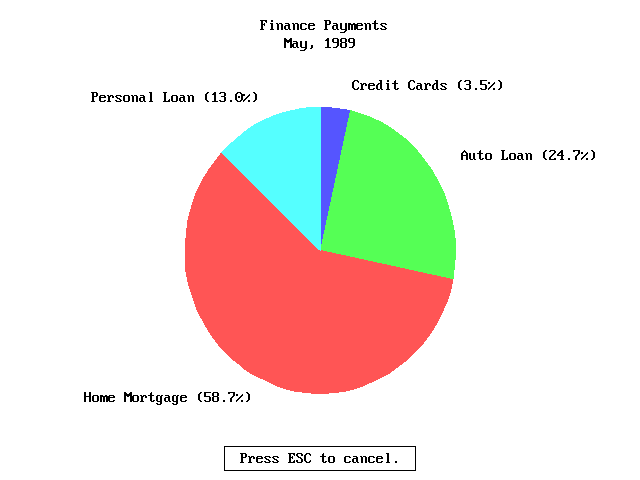 Dad used the spreadsheet function to manage the farms finances until we upgraded to using Works a few years later, I used to experiment with the word processor and graphics (charting). I’ve been meaning to post about this program for a while, but I had difficulties getting it to install and work properly under dosbox. 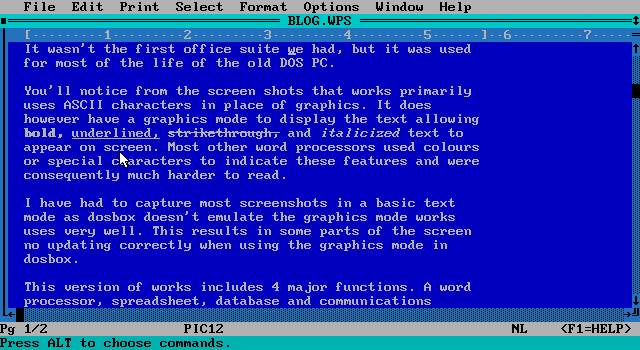 I eventually had to resort to a full machine emulator (pcEM), which would allow me to use all the components. 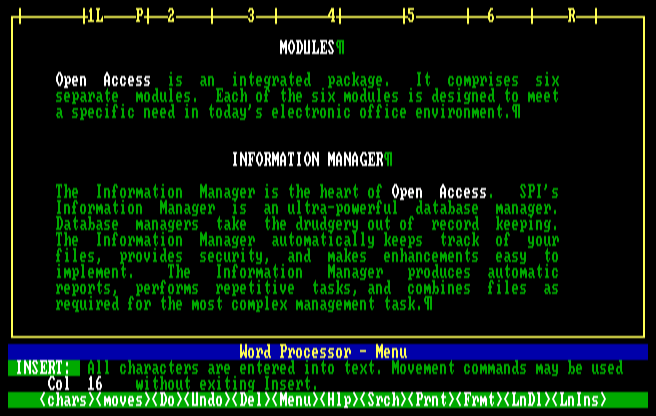 The word processor module is fairly simple, typing a document is fairly straight forward, but there are few features built in. Some notable omissions are a lack of spell checker and thesaurus. There are only a few formatting options, basically the usual bold underline and italics which are displayed as different colours. As a text editor it does serve it’s purpose reasonably well, but isn’t as easy to use as something like Works. 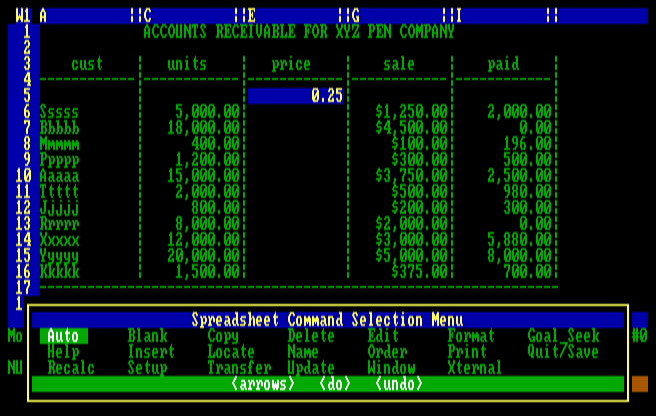 The spreadsheet module got the most use, mostly from my Dad. He said it was a big improvement over doing the books by hand, which was a tedious and time consuming job. This module is much more feature rich and would probably have been comparable with contemporary competitors. Something I did notice whilst playing around was that the formula system has a different syntax that I don’t remember. It’s possibly the same as Lotus 1-2-3 (as that was seen as a standard) but without the manual I can’t make full use of it. Something notable here is that values in formulae do not update automatically, you have to select the recalculate option to refresh those cells. 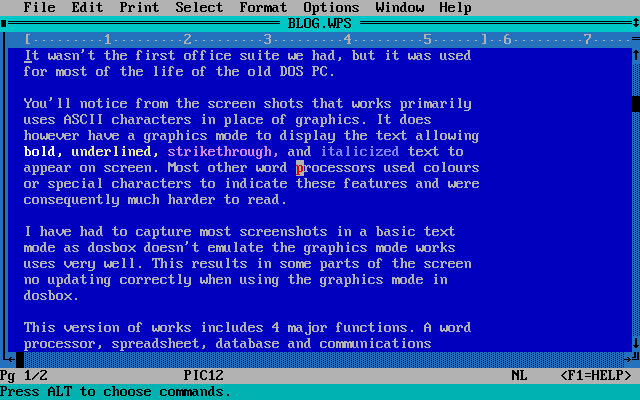 The graphics module was for creating charts. 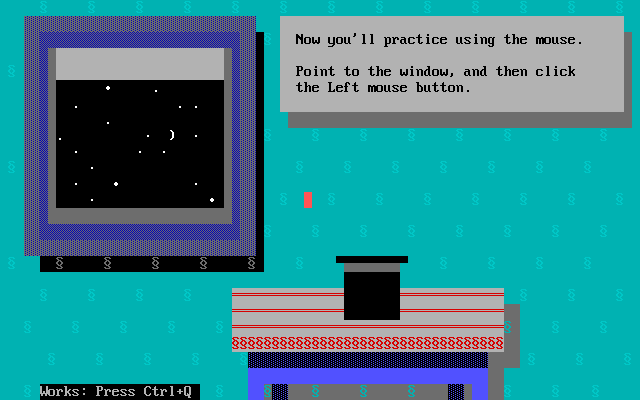 It supported CGA and EGA graphics modes for creating the charts, although the emulation I have can only demonstrate the CGA mode. There isn’t any facility for entering data, instead you need to export a selection of data from either the spreadsheet or database module. 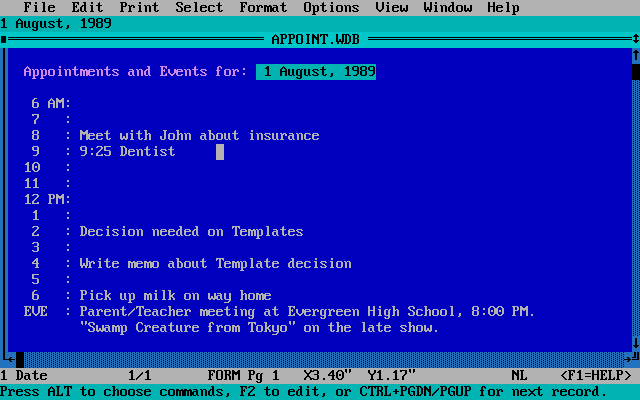 The info management (database) module was something we never used, and I wasn’t able to work out how to use it well enough to get a decent screen shot. Ironically it was one of the most popular features of the software that made it useful for many people. It supported a subset of the SQL language and was capable of storing what was an exceptional amount of data for the time. 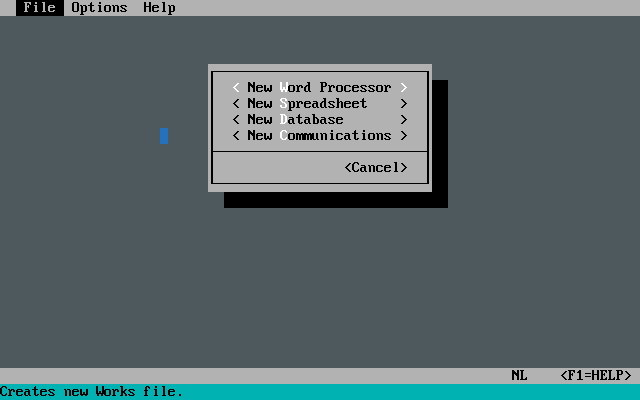 Later versions included a dialect of BASIC called PRO which made it a platform for developing database driven applications. Using Open Access is not very intuitive for a user today as the interface is designed around using function keys on the keyboard. Unfortunately there isn’t really much documentation within the program itself, instead it comes with extensive printed documentation (which is presently at my parents place). At the time it was released this was completely normal, and if you used it often enough you’d soon remember all the function keys, so it wasn’t seen as a downside.